The following is a law firm alert from Polsinelli about new proposed regulations and a revenue ruling regarding OZ Funds. For more information, visit Polsinelli’s website. This article was written by Korb W. Maxwell, Jeffrey A. Goldman, S. Patrick O’Bryan, and James (Brandon) Bickerton. Treasury issued long-awaited Proposed Regulations and a Revenue Ruling today (October 19, 2018) regarding key issues involved with investing in and forming Qualified Opportunity Zone Funds (“OZ Fund”) and the OZ Fund’s investments in Opportunity Zone Businesses (“OZ Business”). Although the Proposed Regulations do not answer all of our key questions, Treasury did provide generally taxpayer friendly guidance to the issues discussed below. These Regulations are only proposed and are therefore subject to further revisions based on comments received by Treasury. However, Treasury has provided that taxpayers can rely on many of these proposed rules, provided that the taxpayer applies the rule in its entirety and in a consistent manner. Land is excluded from the requirement that the original use of opportunity zone property commence with the OZ Fund or that the OZ Fund substantially improve the property, alleviating fears that land could only be a “bad” asset. Very favorably, if the OZ Fund purchases an existing building and the underlying land, the OZ Fund is only required to substantially improve (“double the basis”) the building. The cost of the land is disregarded for this purpose. Partners have 180 days from the end of the partnership’s taxable year to invest in an OZ Fund. Accordingly, capital gains recognized by a partnership early in 2018 (or even very late 2017) may still be eligible for investment in OZ Funds, even if 180 days have passed. A partnership has the option of either investing capital gains in an OZ Fund itself or allocating the gain to its partners, thereby permitting the partners the opportunity to invest their distribute share of the gain in an OZ Fund. If desired, the partner has the option to select the 180-day period starting from the date of the partnership’s sale of the property. The Proposed Regulations provide a working capital safe harbor for investments in OZ businesses that acquire, construct, or rehabilitate tangible business property. An OZ business can hold the working capital for a period of up to 31 months if there is a written plan that identifies the working capital as held for the acquisition, construction, or substantial improvement of tangible property in an opportunity zone and such written plan identifies a schedule of expenditures. This alleviates the concern that cash invested by an OZ Fund in an OZ business would be a “bad asset” for the OZ business. Working capital can be held in cash, cash equivalents, or debt instruments with a term of 18 months or less. An OZ Fund that invests directly in assets must have 90 percent of its assets be qualifying OZ Property. Qualifying property includes an investment into an OZ Business. An OZ Business only needs to have “Substantially all” of its tangible assets consist of qualifying OZ Property. The Proposed Regulations define, for this purpose only, “substantially all” as 70 percent of the OZ Business’ tangible assets. This is critical in allowing investors in non-real estate businesses to take advantage of the opportunity zone benefits. The Proposed Regulations provide alternative methods for determining compliance with the “substantially all” test, based either on the values in an applicable financial statement of the OZ business, or, if the business does not have an applicable financial statement, applying the methodology used by its Fund investors (who hold at least 5 percent of the OZ business) for determining their compliance with the 90 percent asset test. The Proposed Regulations provide that deemed contributions of money derived from a partner’s share of partnership debt do not create a separate, non-qualifying investment in the OZ Fund. There had been concern that the proportion of the investment relating to money borrowed by the Fund would result in a non-qualifying investment. The Proposed Regulations do indicate that Treasury is considering an antiabuse rule for investments that may be considered abusive. In addition, the Proposed Regulations imply that partners in OZ Funds do get outside basis for amounts borrowed by the OZ Fund, thereby potentially permitting the investors to take advantage of OZ Fund losses. Treasury has specifically limited the OZ Fund benefits to gain that “is treated as a capital gain” for Federal income tax purposes. Although this provision could have been clarified better, we think that “treated as a capital gain” is intended to include Section 1231 gains (special rules apply gains from hedging/straddles). Investors must receive an equity interest in an OZ Fund. For OZ Funds organized as partnerships, the Proposed Regulations specifically permit special allocations. Depending on whether additional limits are placed on special allocations, this may permit a certain amount of “carried interest” to be paired with an equity investment for OZ Fund service providers. If an OZ Fund investor sells all of its interest in an OZ Fund before the end of deferral in 2026, the OZ Fund investor can maintain the original gain deferral by reinvesting the proceeds into a new OZ Fund within 180 days. This allows an investor to get out of a bad deal without losing the deferral benefits. Note that the Proposed Regulations specifically deferred until future Regulations issues involved when the OZ fund itself sells OZ Fund property. These issues include what a “reasonable period of time” is for the OZ Fund to reinvest in qualifying assets and what the potential income tax consequences to the Fund and its investors of such a sale of OZ Fund property by the OZ Fund. For purposes of determining whether a Fund holds 90 percent of its assets in qualified opportunity zone property, the Proposed Regulations require the Fund to use asset values reported on an applicable financial statement of the Fund. Applicable financial statements are prepared in accordance with U.S. GAAP and either: (1) filed with a federal agency besides the IRS (which includes the SEC); or (2) are audited and used to make decisions by the taxpayer. If a Fund does not have an applicable financial statement, the Fund must use its cost in acquiring the assets for the calculation. Treasury is seeking comments as to whether adjusted basis or another valuation method is a better measurement than cost. The Proposed Regulations provide for the possibility that an OZ Fund formed late in the taxable year could have to fully comply with the asset tests by the end of that year. 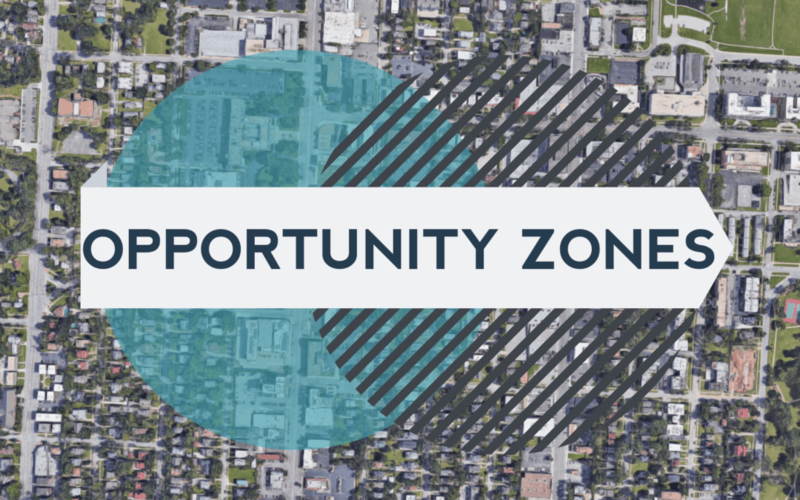 The law requires that an Oz Fund invest 90 percent of its assets in qualified opportunity zone business property, measured as the average of two Testing Dates. The first testing date is the last day of the 6th month following formation, and the second Testing Date is the last day of the taxable year. For example, if a calendar-year fund selects April as its first month as an OZ Fund, then its first testing dates are the end of September and the end of December. However, if a Fund is formed in the last half of the taxable year, then it will have only one testing date, which may be soon after formation. This creates the possibility that an OZ Fund formed in December only has until the end of December to fully comply. We are hoping that the final Regulations will provide more time for the OZ Fund to initially comply. So long as the LLC is taxed as a partnership or a corporation, an LLC can be an OZ Fund. The Proposed Regulations are generally favorable to investors, and so we expect that Opportunity Zone investments will really take off. Based on the 70 percent “substantially all” rule for OZ Businesses, we expect that Opportunity Zone investments will not be limited to real estate investors. In addition, we think Opportunity Zone investments are more likely to be structured with OZ Funds owning OZ businesses rather than the OZ Fund owning assets directly, because of the working capital safe harbor, the substantially all test, and the testing dates for OZ Funds.